If artists work to spark emotion, Geneva D. Benton is especially successful at evoking your happiest feelings. She describes herself as a “self-taught illustrator,” but there are no inclusive words to describe this blooming North Carolina artist. Geneva B. boasts a unique, bombastic style that immediately sparks nostalgia. She creates excitement and forces you to recall your most gleeful childhood memories. Benton’s digital art features black characters like you’ve never seen them before. 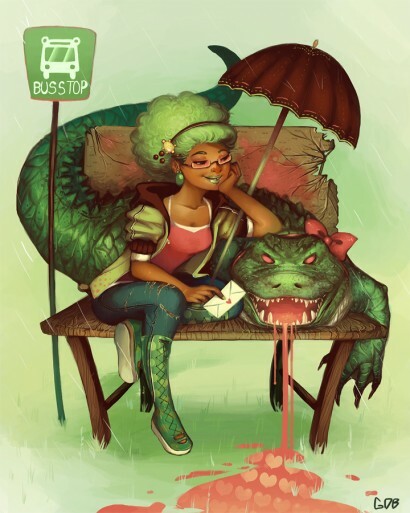 You might describe some pieces as black anime or a doper, more modern World of Lisa Frank. Her vibrant and joy-filled artwork blends fantasy with realistic characters. The more you study her work, the more you'll see that it reaches more than just the young girl inside. All the work by Geneva B. is charming and merry, but her endearing personality shines through when writing about her work. In her latest journal entry, Benton mentioned that many of her ideas are triggered by the colors and shapes she finds in food and flowers. She shared her recent piece, “Melon” on Instagram with an amusing short story in the caption. 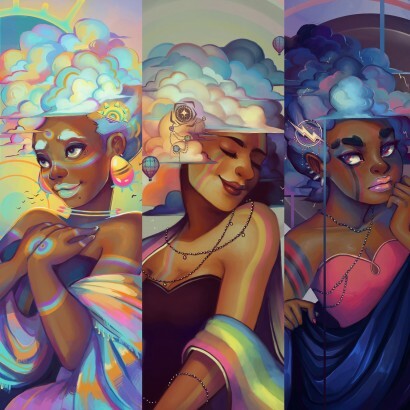 Cloud Goddesses by Geneva B. Photo: Geneva B. [/caption] Each piece whispers, “hold on to your girlhood” when the stresses of adult life threaten your sanity. You might feel inclined to grab a print for your daughter’s room, but chances are you’ll find yourself sneaking a peek as often as you can. Sometimes we have to reach back into our own childhood and bring that happy little girl into the future. She’s a reminder that life is colorful and full of possibilities. Thanks, Geneva B., for putting us back in touch with the lively and fearless little girl from the past.